Militants 44 times fired on the positions of Ukrainian troops. Over the past day, Russia-backed militants have 44 times fired om the positions of Ukrainian servicemen in the area of the antiterrorist operation (ATO) in Donbas. Two Ukrainian soldiers were wounded, the ATO press centre reported on Facebook on 10 April. The biggest number of attacks was recorded in the Mariupol sector. In the area of Novotroyitske, terrorists fired with 120-mm mortars, antitank grenade launchers and IFV weapons. Near Vodyane, Lebedynske and Krasnohorivka, the ATO strongpoints were pounded with grenade launchers of various systems and heavy machine guns. Hnutove and Novohnativka were shelled with grenade launchers, while Pavlopil and Novomykhaylivka were under the fire of heavy machine guns. Ukrainian marines' positions near Shyrokyne were targeted by infantry fighting vehicles and small arms. In the area of Novohryhorivka, the enemy used IFV weapons and fsmall arms against the defenders of Talakivka and Chermalyk. 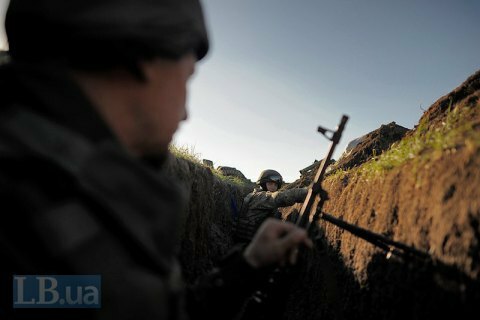 In the Donetsk sector, antitank grenade launchers and heavy machine guns fired on Avdiyivka and the Butivka cmine. Antitank grenade launchers and small arms were used against the defenders of Verkhnyotoretske and Zaytseve. Enemy snipers were active in the area of Pisky. In the Luhansk sector, pro-Russian militants fired with 82-mm mortars, grenade launchers and heavy machine guns on the ATO positions in the area of Novozvanivka. They used grenade launchers of various systems and heavy machine guns against the defenders of Troyitske, Krymske and Stanytsya Luhanska. On 9 April, the ATO headquarters reported 18 shooting attacks by pro-Russian militants. There were no casualties.